Root canal therapy refers to the process of cleaning out the inner aspects of a tooth: the nerve, pulp tissue and blood supply. Root canal therapy is needed when the pulp has been damaged from decay or trauma. 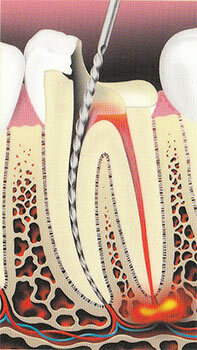 Once the pulp is damaged it breaks down and bacteria starts to multiply within the pulp space or chamber. 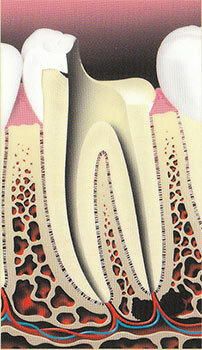 An infection or abscess can develop if left untreated. Root canal therapy will clean out the pulp chamber and seal the tooth off so that bacteria or saliva cannot move from the mouth into the bone or the bone into the mouth. 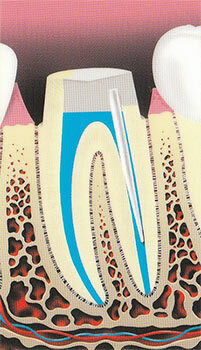 Dr. Weisbard will examine your tooth, take appropriate radiographs and determine the need for root canal therapy. She may refer you to the appropriate board certified specialist depending on the degree of difficulty of the procedure needed in your particular tooth. 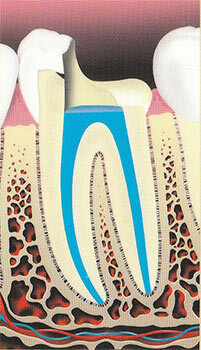 The pulp is removed, and the root canals are cleaned and shaped.